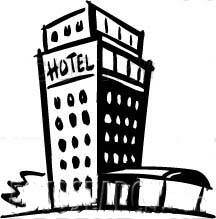 Welcome to the official landing page for all things related to the Central Texas Annual Conference meeting for 2012. This year is a special year as it will be our first Annual Conference under the new conference organization as specified in the Exodus Project; a time to gather shortly after General Conference has concluded its business and a few weeks before the South Central Jurisdictional Conference kicks off in Oklahoma City; and, most importantly, it’s always special when the souls of the Central Texas Conference join together in one location. We hope you are as excited about the work being done and to be done by the people and churches of the conference as we are. We will populate this page with information regarding Annual Conference 2012 as it becomes available, so bookmark this page and check back frequently for any new and updated announcements, forms and other content. You can either click on the links below or in the navigation bar to the left. The 2012 Annual Conference Worship Guide is now available for download. The Worship Guide for the Annual Conference 2012 has followed in the digital footsteps of the Preliminary Journal and the Addendum to the Preliminary Journal and is now available for download. The 2012 Worship guide features the litany for the Opening, Remembrance, Retirement, Commissioning and Ordination and Act of Repentance services to be observed during the 2012 Central Texas Annual Conference meeting. To download a pdf, ePub (for iPhone, iPad and Android devices) or mobi (for e-readers like Kindle or Nook),click the Worship Guide tab to the left or the image to the right. Online Registration for Annual Conference is Now Closed. 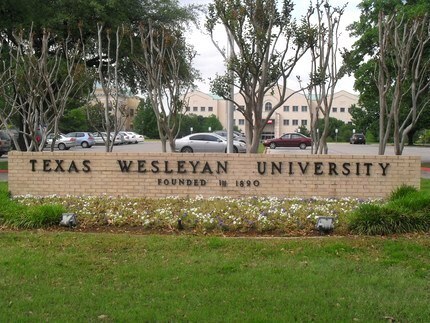 If you are a lay or clergy voting delegate to Annual Conference and haven’t yet registered for the meeting, you can now only register in person at the Waco Convention Center beginning at 3 p.m. Sunday, June 3. As a reminder all voting members must register before they can receive their floor credentials. We are still in need of volunteers for Monday, Tuesday and Wednesday of Annual Conference to serve as Hospitality Greeters. 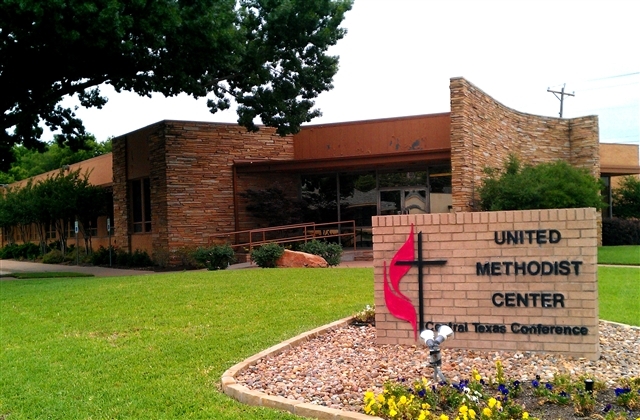 The schedules for greeters is 7:30 a.m. to Lunch Break and then from 1:30 - 5:15 p.m. Also, volunteers are needed as Parking Lot Guides at Austin Avenue United Methodist Church on Sunday and Tuesday nights from 6:30 - 7:30 p.m. If you would be available for any of these times, please contact Pat Stroman at 254-772-2316 (home), 254-716-0940 (mobile) or by email at pstroman@aol.com. 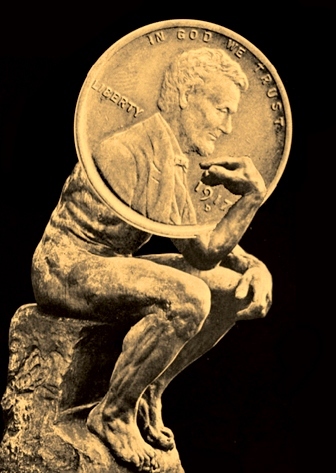 When is the last time you actually received a penny for your thoughts or truly felt like you got your full two cents worth? Well, if you happen by the Idea Store at annual conference, that wait will most likely be over. The Idea Store is a unique and original way to discover and share ideas from around the conference that could help you and your church in our collective mission to make disciples of Jesus Christ. To see a little more about how this works, view this 30 second video from Idea Store originators Kyle Roberson and Jason Valendy and make your plans to visit the Idea Store located in the Annual Conference display area at the Waco Convention Center. 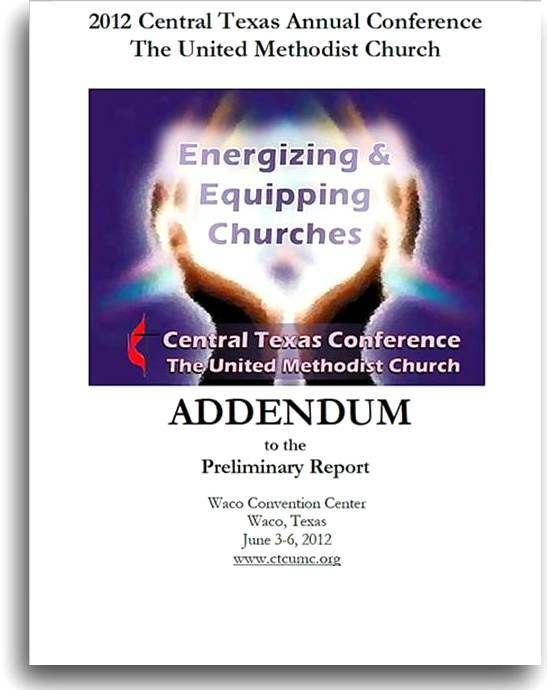 Addendums to the 2012 Annual Conference Preliminary Report have been finalized and are now available. The Addendum includes the report from the Conference Service Center Relocation Task Force, the Consent Agenda, the Conference Scorecard, a Board of Pensions report and more. 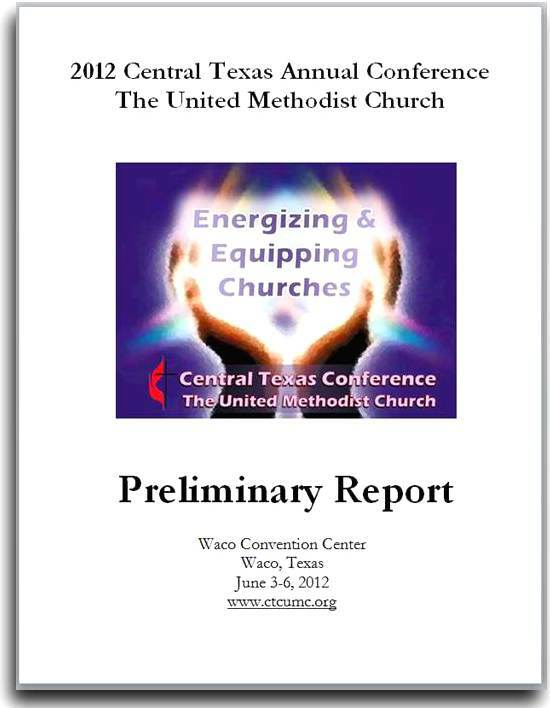 To download a pdf, ePub and/or mobi file visit the 2012 Preliminary Report link on the Annual Conference tab of ctcumc.org. 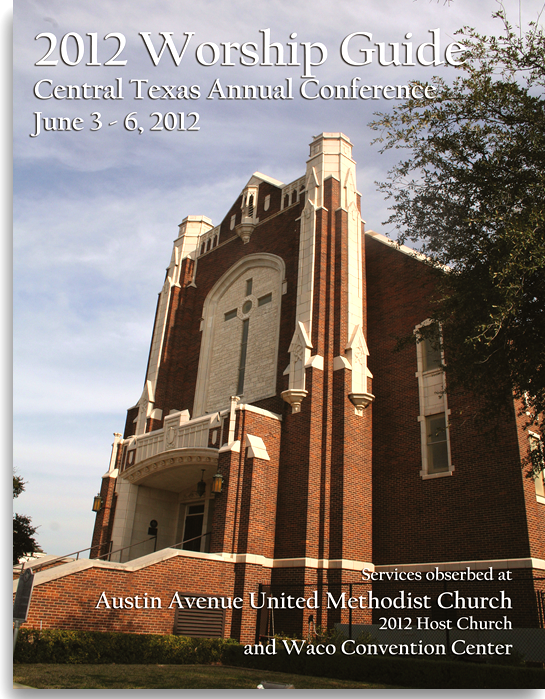 The Preliminary Journal for the 2012 meeting of the Central Texas Annual Conference has been finalized and is now available. You can download a pdf, ePub and/or mobi version of the journal by clicking on the Preliminary Report image to the left. The official Annual Conference hashtag is #CTCAC2012. For those of you who have enjoyed following General Conference via Twitter, we have established the official hashtag for the CTC Annual Conference so that you may similarly participate in our meeting this June. We have claimed #ctcac2012 as the official hashtag for this year. Feel free to share and start the conversations flowing today. Just go to Twitter.com and search #ctcac2012.